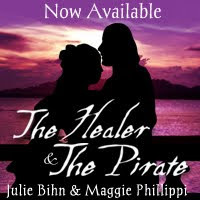 Another review from Julie! Borrowed this one free for Kindle from my local library! Oh, and as a note, I read this completely in the wrong order...I started with The Bone House (book 2 in the Bright Empires series), then The Spirit Well (book 3)...and then made my way to Book 1 a couple months later. So my perspective may be a bit odd. And frankly, if you've read those reviews, there's a lot of overlap with this one. Ridiculously simplified summary: First in a series. Kit, a hapless young man, is dragged into the world of magical ley lines, which take travelers through time and place, and to parallel dimensions. Along the way, Kit's girlfriend is literally lost. 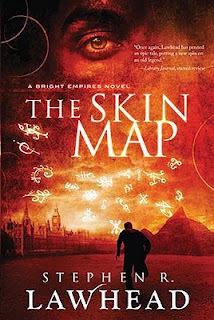 Of infinite importance is The Skin Map, a guide to the numerous pathways between worlds...which must not fall into the wrong hands. "To our success!" cried Etzel gladly. "May it please God." "May it please God," echoed Mina softly, almost to herself. And something in her stirred at the thought. Compelling: 7 out of 10. Like the other books I've read in the series, there are some storylines I loved (I found the book worth reading just for Wilhelmina and Etzel). Others, not so much. Since I knew the ultimate outcome of some of the storylines, they weren't as interesting as they might have been otherwise. Characters: 7 out of 10. Pretty much exactly like in The Bone House. Lady Fayth was interesting, though if I hadn't read later books I'm not sure I would have liked her. Wilhelmina and Etzel...I thought Etzel did bring up things being God's will and such a bit gratuitously by the end, but I still could just hug him, and it was so much fun to see Mina's progression. Lord Burleigh was nicely scary. As for the main character, Kit, I still found him rather dull. Writing/editing: 7 out of 10. Overall solid writing and I didn't notice any outright errors. The use of unusual dialogue tags (things like "Kit allowed" instead of "Kit said") was here in full force, which made it especially difficult to read the long conversations. I had a bit of difficulty following the fight scenes, and found some of the descriptions of the foreign places they visit overly long and dull. But then, my main interest is the concept of space/time travel, and seeing how people interact in these worlds...not watching fights and reading descriptions longer than my Kindle screen. Plausibility/believability: 4 out of 5. Lots of details about each locale (I occasionally found it to be too much). The place Mina ends up, and who rescues her, could arguably be considered too convenient, though I found it more Providential than anything else. Positive: 3 out of 5. Not really a happy ending in any way, though it's a series, and there's a hint of hope at the end. Gut reaction: 3 out of 5. I have no idea if I would've maintained interest in the series based on this book. By book 3 I was hooked, though. Reading this one out of order was fun because you could see what was set up here and then explained later. I can't fathom the amount of planning this series must have taken. Recommended for: Fans of time-travel fiction, not necessarily Christian. *I borrowed this book free from my local library. ...I refuse to join the stalkarazzi as they giggle and bat their eyes, but their worship has me curious. Did I miss something spectacular about the kid this morning? Does he sparkle in the sunlight? Does he have fangs? What? Shannon McDermott always writes better entries than I do and she had a good, fairly brief rundown of angels in the Bible. And if you didn't see it, Anna Mittower links to a very good interview with the author (and also has a scavenger hunt!). After reading the interview, I can see where Dittemore is definitely suited for the young adult market. 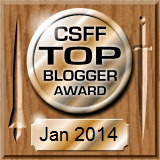 (I was shocked to see who the biggest influence in her writing career was!) I'm interested to see what series Dittemore might write in the future. One parting thought that came to me yesterday. Recently I started watching the show Leverage in syndication. (By "recently," I mean a full 3 days before the season finale aired--I sure can pick them.) The show is basically about a gang of cons and grifters using their deceptive powers for good. It's not uncommon for the gang to perform a good deed, using secret identities, and then vanish suddenly. For instance, in a recent episode, one member posed as an "air marshall" who helped save an innocent woman from certain doom (and then the gang asked her to do a good deed herself that could, in theory, endanger her own safety). Presumably, if the woman later tried to find that anonymous air marshall, not only could she not track him down, but no one would have any record of him even existing at all. If Dittemore's speculations are even remotely right--and they're not un-Biblical--then REAL angels could be doing that exact same kind of thing this very moment. So I've probably written more than my fair share of less-than-glowing reviews. 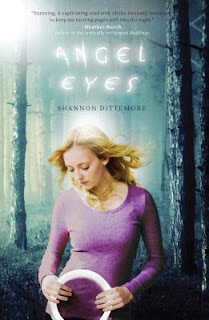 When I saw we were doing Angel Eyes by Shannon Dittemore (website, Facebook), I was wary. Angst-filled girl moves from the big city to a small town to live with her father, and then a strangely attractive, apparently supernatural young man shows up at her high school and evidently has a thing for her? OK, granted, I haven't read Twilight but I KNOW Twilight's not my cup of tea and I assumed this wouldn't be either. I didn't request a review copy because I didn't really want a copy of a book I didn't think I'd like and I REALLY didn't want the obligation of reading a book that I thought might be pure torture. But, my local library had an electronic copy that I could borrow on my Kindle for free. So here I am, writing my review! Ridiculously simplified summary: Guilt-ridden teen Brielle moves back to the small town of Stratus. She meets a mysterious young man named Jake, who speaks of angels. Turns out, there's a whole spirit world Brielle never knew of...and even the physical world around her has more darkness than she could ever have imagined. "Lean not on your own understanding." The words are melodic, fortune cookie-ish. Any protagonist comparing the word of God to a fortune cookie, without instantly being corrected, makes me squirm. Oh, and let's make it clear. I'm female, but not a teenager. I was never into much of what teen girls were "supposed" to like back in my day (Beverly Hills 90210, Saved by the Bell, New Kids on the Block). As I hinted at, I don't care for Twilight. In short, I am not the target audience. (IANTTA) But hopefully the rating system will help make things a bit better. Compelling: 6 out of 10. I can't stand when characters spend their time moping and pitying themselves, and at the start, that's Brielle's forte. She spends (literally) the first quarter of the book beating herself up with guilt over some unstated awfulness in her life. And even once we find the source, her guilt didn't feel quite right to me. That's not necessarily unrealistic, but not something I want to read. The middle section, where we start to learn about the world of angels and demons, is more interesting, and there are parts I absolutely devoured. The world set up is fascinating, with a lot of potential. One of the back doors is missing a handle, and the other is red. It just made me laugh. (Which shows that yes, "is"es can work just fine.) The descriptions of the Celestial world, too, are interesting--I couldn't have come up with them. I didn't notice any glaring editing issues--aside from the editor letting a couple (teen-friendly?) "Nooooo"s slip through--those read like fanfic to me. I didn't notice any major Kindle formatting glitches. Plausibility/believability: 2 out of 5. I'm still a bit squeamish about people writing fantasies about rules that angels have (mostly that one angel's only guidance from God is being given clues that he has to decipher). But as I mentioned earlier, I'd say that most of it is more extra-Biblical than anti-Biblical. I don't personally believe real angels are quite like the ones in this book, and I'm not so sure they literally live among us long enough to even raise a child as their own, as Canaan does. And I really have difficulty believing God actually gives angels clues so they can try to do His will--though I can't say that it's completely impossible, and I don't mind the speculation. In short, Dittemore does quite a good job painting the world, with only a few inconsistencies. I enjoyed the angelic aspects on a speculative level, and they made me think about the spiritual level. If plausibility were just limited to the spiritual element, I'd give this at least 4 out of 5. But what really got me were the problems in the "Terrestrial" world, and specifically, the human trafficking subplot. The way I read it, at least, the captives were primarily white, middle class, and fluent in English. Human trafficking is a terrible thing and I'm not denying it happens in America. But I live in a world where a (white, American) girl who's kidnapped and kept as a slave can make the news years after her rescue, and where I live, the "Fundamentalist" polygamist Mormons in Colorado City make the news with some regularity. I just can't believe that numerous well-connected families' children would be kidnapped and no one even noticed. I'm not sure how it should've been handled, given how distasteful it would be to have the white/middle-class kids save the minority kids. Frankly, I would've personally rather that part of the plot had been more subtle to begin with, as I thought the spiritual element was intense enough without such an extreme ending. By the end, I didn't feel like I was reading the same book I'd been set up for. But hey, (IANTTA). Gut reaction: 2 out of 5. ...I guess a trend of YA novels is to have a nice happy ending, and then in the last few pages, throw a huge wrench in it to try to make you read the next book? It happened in The Hunger Games and it happened here. Frankly, that infuriates me. If you want to hook the reader, throw a few paragraphs or even a chapter from the sequel in at the end. But I think a book should stand on its own. Having something random go wrong to entice the reader to keep reading makes me not want to read, and makes me less interested in reading the rest of the series. I also found it disturbing that multiple villains are described as having "dark hair, dark eyes, olive complexion." Granted, there are a lot of villains, but it just rubbed me the wrong way. Recommended for: I think this would be an excellent book for fans of "angel" books. It gives an actual Christian point of view--I don't agree with every bit, but it's a far sight better than many portrayals. It might help if you are a teenage girl, though! *I downloaded this book free from my local library. Julie here for the CSFF Blog Tour! This month the book is Angel Eyes by Shannon Dittemore (website, Facebook). Angel Eyes is about two teens' journey through the world of something most people never see: angels and demons. If human beings could only see the manifestation of such a weapon, they would understand how it paralyzes, literally holding them captive with the glue of it. ...but Damien finds little delight in the pain he's inflicted. Pain is not nearly as satisfying as fear. That said, I wonder...is it Biblically accurate, that demons love fear even more than pain? When their mission (even in the book) is to steal, kill, and destroy? Of course, the Bible repeatedly instructs us to "fear God." Getting into the actual meaning of "fearing God," contrasted with the Biblical commands to "not fear," is outside the scope of my discussion here. OK, mostly I'm not knowledgeable enough to get into it, though if you have any thoughts, I'd be interested to hear. On the other side of fear, even ignoring the fear the Israelites' enemies certainly would have felt, just looking up the word "fear" comes up with a lot of instances of fear that doesn't seem to be against God's will. For instance, people fear the Jews (Deuteronomy 11:25; Esther 8:17) , and God Himself threatens or promises to punish Israel by what they fear, if they're unfaithful (Ezekiel 11:8; Leviticus 26:36). In the New Testament, even Jesus calming the storms made his disciples afraid (Luke 8:25). I don't like to think that after Jesus performed an amazing miracle, his disciples were covered in the sticky black tar of fear, demons looking on in glee. Anyway, I wouldn't say the "fear" imagery is anti-Biblical, per se, though I'm not convinced in the world outside of the book, "fear" is always a bad thing. I see the book as more extra-Biblical, speculating about how things could be, more than reflecting about how things certainly are. But it mostly felt plausible to me, unlike some other angel books I've read. I don't know that I completely agree with the portrayal, but I was willing to follow along anyway, as a "well, maybe it could happen this way." From the little I've seen of angel books, I think Angel Eyes is a rarity in that regard, since so many other books get it so distinctly wrong. Content: The violence didn't upset me, and no sexual content that I recall (just some light romance). I can't see how to review this book without taking the heavy Christian content into the review itself. The whole story is very clearly allegorical, with Aethelbald loving the unlovable princess, willing to sacrifice himself for her, etc. To me, a good allegory should stand on its own--that is, the character's actions should make sense even if you don't know the source material. Here, I thought the allegory overpowered the characters' story, rendering the two main characters rather lifeless. Compelling: 6 out of 10. While Felix seemed interesting, I got rather bored with all of Una's courting. Approximately midway through the book, the story got much more interesting. I started getting lost in the end, but I find that to be the case for me with many fantasy (and other) books. Characters: 4 out of 10. Some characters were fairly charming (like Felix--although this deleted scene from a later book made me dislike him). Some characters were at least interesting and entertaining, if not entirely sympathetic (like Leonard). Monster the cat was adorable. I realize that allegorically, Una was supposed to be unlikable, but it was hard for me to read about a foolish, selfish character. She finally got some spirit about midway through the book and I started to like her more, but I felt like she was lifeless at the end, almost slavishly devoted, but without the passion I'm used to seeing in romance novels. At first I really liked Aethelbald. Una derided him as "boring," despite the fact that is the Prince of the fairies, and came with a whole group of magical people at the beginning of the book. Instinctively, I rankled against her assessment of him, and decided he wasn't boring at all, particularly given the patience he had with Felix (in short, the unfortunately-named Aethelbald was cool). Note to authors, if you want me to like a character, tell me how bad they are. But as the book progressed, I started to see why Una found him boring! His initial passion toward Una, abruptly asking for her hand in marriage, was endearing, but I feel like that passion dwindled toward the end. I don't know for certain if the other books in the series address some of the other characters brought up in this book, but for me, some of the more interesting characters' storylines just fade away. With that, she turned on her heel and marched down the corridor, the blind cat trotting behind, unlike a dog in every way because, of course, he wasn't truly following her. He merely happened to be going her way. It appears the publisher forced the book to be a certain font, so that could have something to do with the actual glitches. I'm assuming the later books don't have this trait, but at least a couple bits come straight from Narnia. (Though I'm glad she's evidently read those books!) The main borrowing is a major plot point, but there is another point where Aethelbald is leading some doubters and they think he's disappeared over the edge of a gorge, but are commanded to follow, only to find that he's in fact on a path. To me that felt more like lifting directly from Aslan in Prince Caspian, more than an homage. Positive: 2 out of 5. There's just a whole lot of destruction later in this book. But what upset me most was the repercussions of the allegory. I couldn't ignore the idea that Aethelbald was the Christ figure, yet he loves and is hoping to marry just one of his followers, even though he asks others to follow him. That would give the follower he marries a closeness that no other follower could hope to possibly attain. In fact, Aethelbald seems to divide his time between two realms, but from what we see, he doesn't seem too upset if the rest of the human world burns, so long as he can save Una and her family. Is that the point? And is it true that Jesus doesn't care so much what happens to anyone but a small group? In fairness, as an allegory it does show that while we were yet sinners, Christ loved us. I just would've preferred if the allegory were less pronounced. Gut reaction: 1 out of 5. 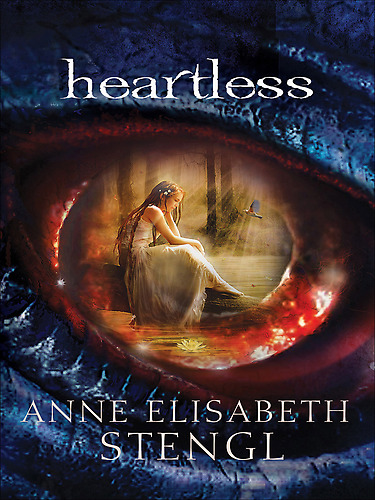 Recommended for: Fans of fantasy and Christian allegory; people who value plot over characterization. *I downloaded this book free on Amazon.